The Wild Country Meshuga is a refreshing entry into the world of climbing shoes: one that attempts to do something different to the competition. With its moderate downturn and velcro closure system, the Meshuga will perform better on steep ground than its sister shoe, the Parthian. It's the new rubber and unique upper construction that really sets the Wild Country shoes apart. Michelin® Formula Wild is a new compound that, amongst other things, offers better consistency in a wider range of temperatures and, thanks to injection moulding, a seamless design with a variable thickness. This technology allows Michelin to create varying levels of sensitivity and durability across the entire sole, something that can't be achieved by traditional rubber cutting methods. As for the upper, a layer of PU (polyurethane) is sandwiched between two microfibre fabrics to create durable tension in key areas. PU can create 10 times more tension than rubber of the same weight and volume, and it has a longer lifespan. The result is a shoe that maintains its performance for longer. 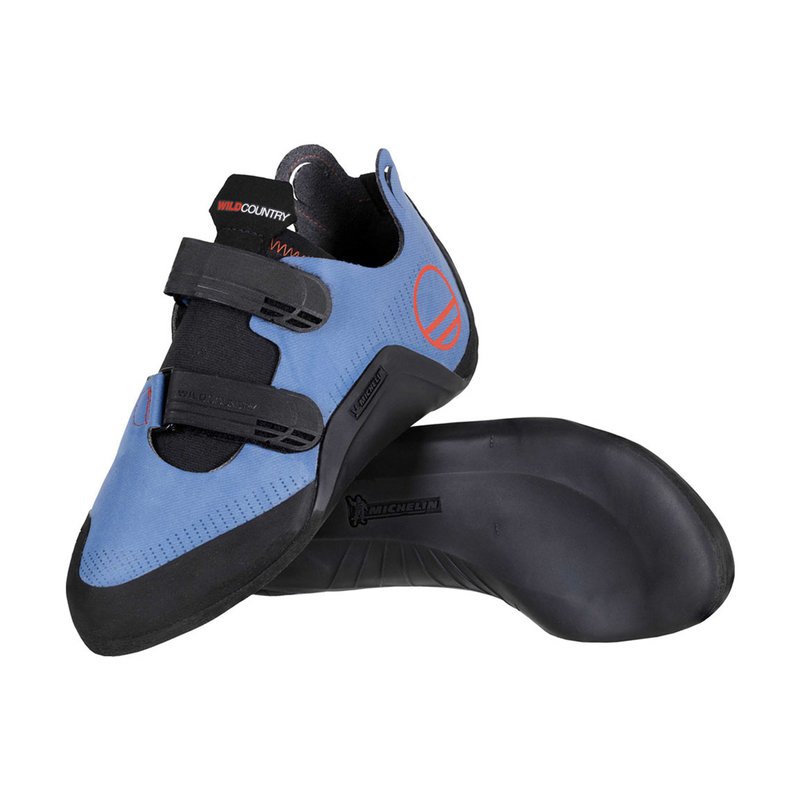 As is the case with all new climbing shoes, the Meshuga has to contend with an abundance of high quality, well established favourites. But, if you're looking for something different, the Meshuga is one of the most innovative climbing shoes to be released in a very long time. Michelin's Formula Wild is developed to offer greater grip and edging support than all other climbing shoe rubbers on the market. With its unique one-piece moulded construction, it offers unique benefits when compared to traditional, cut rubbers: it's consistent in performance in different temperatures, the variable thickness can be implemented to offer greater sensitivity and precision, integrated arch support enhances stability and torsion resistance, and there is absolutely no waste produced from offcuts.